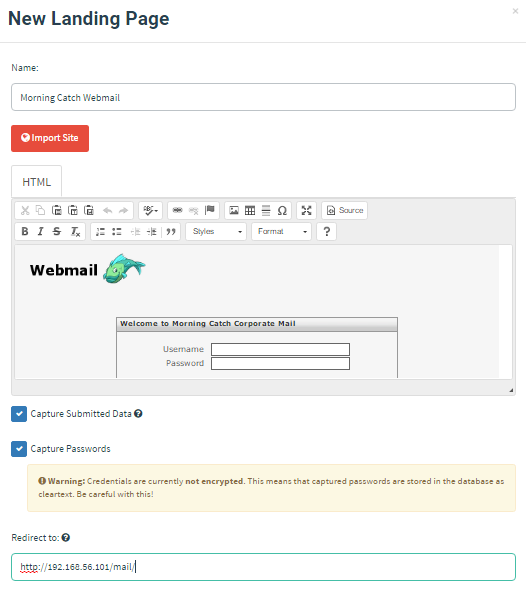 The Morning Catch corporation has a webmail portal that we will clone for our landing page. Start by navigating to the "Landing Pages" page and clicking the "New Page" button. To import a site by URL, click the "Import Site" button. The webmail portal is located at /mail/, so I will use http://192.168.56.101/mail/ as my import URL. ​ After the import, you'll see the HTML populated into the editor. Clicking the "Source" button shows a preview of the page. Finally, we'll capture submitted data and passwords by checking both options, and we'll redirect users to the webmail portal after they submit credentials. Finally, click "Save Page" to save the landing page.